1. 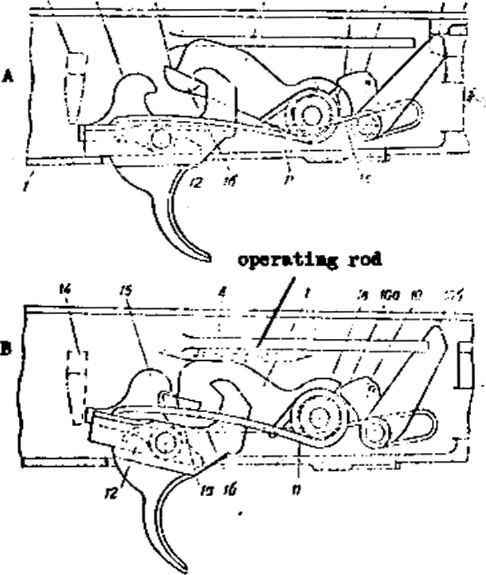 Rear sight leaf bent causing the bullets to deviate in the direction in which the sight is bent; the rifle must be sent to the repAiT shop and rechecked for accuracy after repair. 2. Front sight slide displaced to the side, causing the center of impact to deviate in the direction opposite that of the displacement of the slide (displacement of the slide is determined by the position of the alinement lines on the slide and the front sight base); the front sight slide is set even with the line on the front sight base and then the rifle is checked for accuracy. 3. Front sight slide insecurely installed; the rifle must be sent to the repair shop. 4- Loosening of the front sight; in this case, the center of impact will be deviating in the direction onposite that of the sight displacenent (upward when sight unscrews and downward when sight lowers); the front sight must be removed in order to widen the leaves; if the front sight is not held firmly, it must be replaced; after all these operations, the rifle must be checked for accuracy. 1. Large play of rear sight leaf; the notch keeps shifting when the rifle is fired to cause dispersion. The serviceability of the rifle nuafe.be determined by careful inspections, check of caliber, and fire for accuracy, if any of the above irregularities are present.